It’s a scary thing to think about having a tree fall on your house, your car, or even just somewhere in your yard. Trees are generally big and can do a lot of damage to whatever they fall on. You often hear about trees that fall during storms, and see pictures on TV of the destruction they cause. Then you may begin to worry about the trees on your property and wonder if and when one of them could fall. 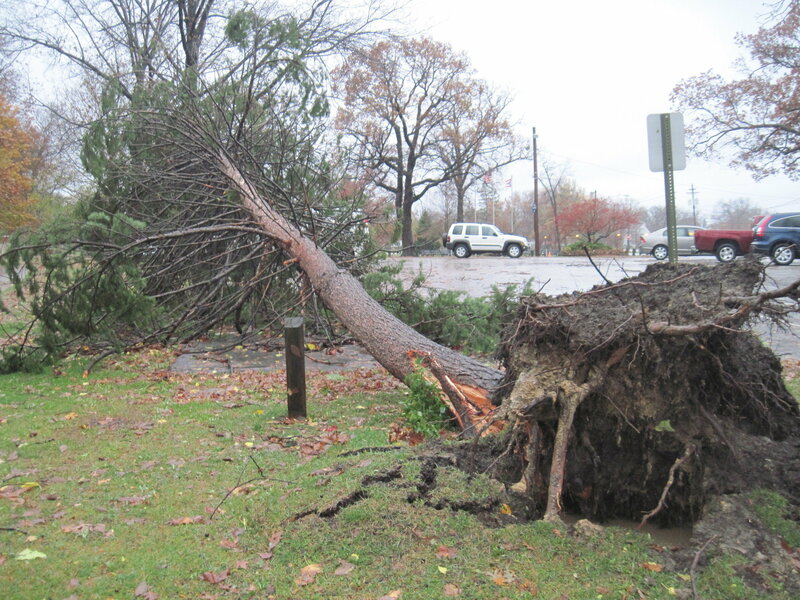 Wind-throw is a technical term for the occurrence of a tree being uprooted. When force is applied, such as wind, the trunk acts like a lever and in falling, pulls up its own roots. The taller the tree, the more susceptible it is to wind-throw. One of the major causes of trees falling is when there has been an overabundance of rain, and then a wind comes along. Because the majority of a tree’s root system lies a mere 18”–24” below ground, when that soil becomes saturated, it is easier for a good stiff wind to take down a tree. With a root system that can be up to two-and-one-half times. What Type of Tree is More Likely to Fall? Is there any one kind of tree that is more likely than another to be uprooted in a storm? Well, yes. It seems as though balsam, cedar, willow, fir, white pine, white spruce, and sometimes hemlock are more likely to fall during a storm. Generally, though, this is because they are growing in wet areas. The taller the tree, the more likely it will be to fall when the soil becomes too saturated and unstable. There are places that trees grow that may make them more likely to fall than are trees in other situations. Because trees that grow in a rocky area, or in shallow soil can’t put down roots as deep as they should, will fall more easily than will others. Trees that have grown up in a cluster, such as in a forest or a thick wood, are dependent on one another for support. When some of the trees are removed, either by logging, or to clear land for housing developments, the trees that are left are weakened and are more likely to come down during severe weather. The root system of deciduous trees generally spreads out farther and larger than does that of conifers. This contributes to their greater stability in time of rain, flooding, and windstorms. The type of soil also affects the ability of a tree to remain upright in adverse weather conditions. Trees that are in an area where there has been recent construction are often damaged. The damage may be invisible to the untrained eye, but is there, nonetheless. As mentioned above, when trees are removed from a building site, and only a few, or maybe just one is left, that tree has lost its support system. The act of construction itself damages nearby trees, also. The movement of heavy equipment, machinery, and other vehicles back and forth over the root system damages it, often beyond saving. The damage may not be noticed for five or even ten years when the tree begins to die, but it’s been done. Other damages such as broken limbs, hitting the tree and scarring it, also harms the tree. A tree thus compromised, when put to the test in a severe storm, will be far more likely to be uprooted than will a stable, healthy tree. Sometimes it doesn’t take a big storm to cause a tree to uproot and fall. If the tree’s root system has been compromised, if it is very tall, if it has a lean to it, it will be possible for it to fall. The slow, incessant rains of winter can so saturate the ground that a compromised tree may fall even when there is no hard wind. Adverse weather isn’t the only time that the soil under and around your trees can become saturated. Overwatering of your lawn, flowerbeds, or garden area can also cause the ground to become saturated. If at all possible, set your watering system on a timer that will turn the water on and off for appropriate lengths of time. If you have to set your sprinklers manually, set a timer in the house or on your cell phone to remind you to turn it off. If you forget and leave the water running for hours on end, the ground will become soaked, weakening the root system of your trees, making them more susceptible to toppling over. Since it usually isn’t known a long time in advance when there is going to be a severe storm, you should do all you can to prepare your trees to withstand any amount of wind and rain that might come. Smaller fruit or other types of small trees can be staked when they are young to help them to grow straight trunks. A sturdy, straight trunk is one step in making your tree stable. If you choose to plant a new tree, be sure to plant it in the best location and in the best soil available to you. For trees that were already on your property at the time of purchase, you don’t have any choice on their placement. However, you can monitor the health of the trees to ensure that they remain as healthy as possible for as long as possible. A sturdy, healthy tree is not as likely to topple over when the ground around it becomes completely saturated with water. Call on your local certified arborist to come out and evaluate your trees for stability and health. He or she will be able to guide you on things you can do to keep your trees as healthy as possible and steps to take to possibly prevent them from uprooting during storms. Proper pruning may avert limb loss, and it may balance the tree better so that it will stand through a storm, even in saturated soil. In extreme cases, the arborist may recommend removing a tree if it is deemed to be dangerous.